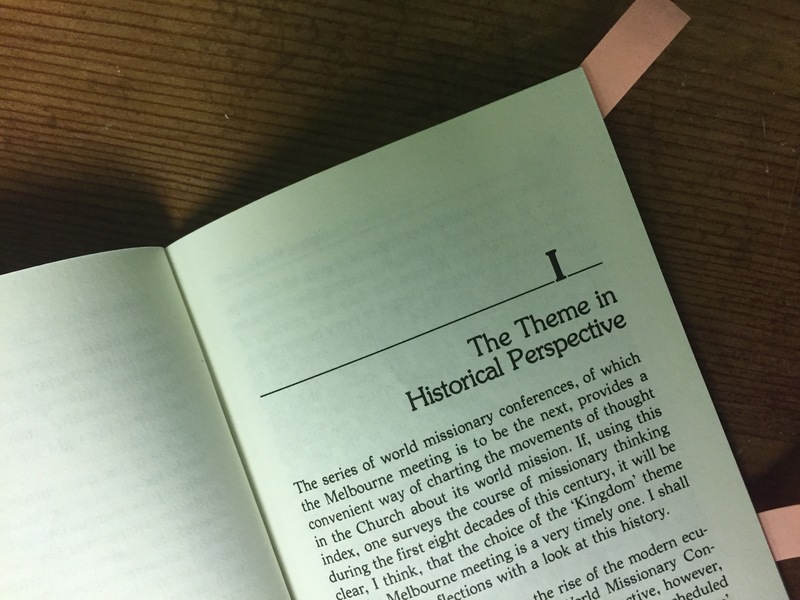 In the first section of his 1981 book Sign of the Kingdom, “The Theme in Historical Perspective”, Lesslie Newbigin outlines different stages (emphasises) in the discussion of Mission throughout the last century then offers his reflections on the relation of each to “Kingdom”. In this post we will look at the first three stages, then compare them with the church today. In the history of Mission, Newbigin begins his discussion with the World Missionary Conference in 1910, where the focus was on bringing the Gospel message to every person—stage one—. But by the next Missionary Conference (1928) the “main emphasis [was] upon the life of nations as a whole, rather than upon the destiny of individual souls” (p 3)—stage two—. While there was some discussion of “Kingdom”, “in this interpretation, the kingdom is seen as something much broader than can be defined by allegiance to the Person of Jesus Christ” (7); instead, “The centre of the picture was full of activities designed to promote mutual understanding and to furnish the less advanced nations with the amenities which western technology made available” (7-8). Newbigin later identifies two dangers which can be seen in this second stage, which the Church continues to fall into: (1) Separating Kingdom from Jesus; and (2) Separating Kingdom from the Church. This set the tone for the next 25 years: “The Church—so long taken for granted or ignored in missionary discussion—was seen as the bastion of truth in a swirling sea of falsehood…” (9). It was now “the beginning of the long period of Church-centred missiology” (10)—stage three—. Newbigin continues his outline through the 50s-70s, but we’ll skip ahead now. On the other hand, we have my generation’s focus on social justice; and we must be cautious to avoid falling into the trap of Newbigin’s second stage. Often our motivation is to follow Jesus’ example, but we aren’t sure where proclamation should begin, or even what it looks like. We are at the place “where the deed is easy and the word is costly” (Mission, 14). In the next post we will look at Newbigin’s chapter, “The Theme in Biblical Perspective”.